Speight Jenkins has often said, “When we present a new opera, what we really ought to do is to play it through, take bows and applause, and then tell the audience, ‘OK, now we’re going to play the whole thing a second time.’ Because no one, no matter how musically intelligent you are, can possibly hear everything in an opera on a first pass through.” Listening to a new opera—or indeed, any piece of music—the first time is like laying down tracks for the railroad; that first time, your brain is busy mapping out “how the song goes.” Hearing it then a second (or third or fourth or—in the case of some Wagner fans—the fiftieth) time is more like enjoying a train ride along well-worn tracks. Speaking generally, Amelia is an opera in the tradition of Puccini, Strauss, and Britten, the most popular opera composers of the twentieth century. It’s full of arias and ensembles showcasing the emotions of the characters (and the beautiful voices of the singers); plus, the entire piece is built from a core vocabulary of musical ideas, terms, phrases, and images. But unlike our standard Seattle Opera fare, Amelia is an opera in the American language, about American lives and American issues. 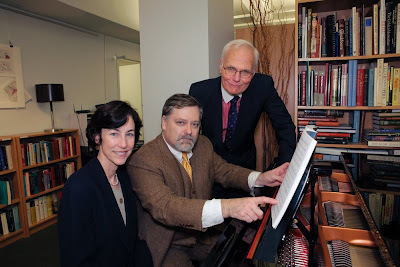 Librettist Gardner McFall and Composer Daron Hagen (pictured above with Speight Jenkins; Ken Howard, photo) are making poetry and music about their experiences: losing parents, having children, living through the Vietnam war. The musical themes—-which are also the poetic and emotional themes of the opera-—begin with composer and librettist, with how they think. Daron Hagen, in particular, describes himself as having an ‘associative’ brain: one thing makes him think of another, which leads to another, and another in quick succession. Musical themes and motives, with their semiotic game of signifier-and-signified, are bread and butter to a mind like Hagen’s. For most opera-goers, motives register subliminally; but in the composer’s brain, everything operates at the level of conscious awareness. If (like Daron Hagen, whose father was a radio man for the Navy, or Gardner McFall, whose father was a Navy pilot) you have real-life experience with that rhythm, you’ll automatically tense up when you hear it in the opera. The libretto even comments on the use of Morse Code: The Flier (Amelia’s dream of Amelia Earhart), when crashing into the Pacific, admits that she never learned Morse code--not that knowing it would help her in her predicament! But by the time Aunt Helen sings that melody, we’ve already heard the Navy hymn dozens of times, motivically. Sometimes Hagen simply uses steady progressions of reassuring tonic chords, a hymn-texture, as for example when he introduces the men in Amelia’s life (her tenor father, Dodge, and her baritone husband, Paul); at other times, he uses the tune of the Navy hymn’s cadence, or musical completion (the part that goes “For those in peril in the air”), often to comment on the frustrating lack of completion in Dodge’s missing-in-action status. But it isn’t necessary to analyze the motives in Amelia (or in any opera, for that matter) to enjoy its music. Starting tomorrow, I'll be looking through the six scenes of the opera with an ear to the voices who star in the show and the arias and ensembles they sing.